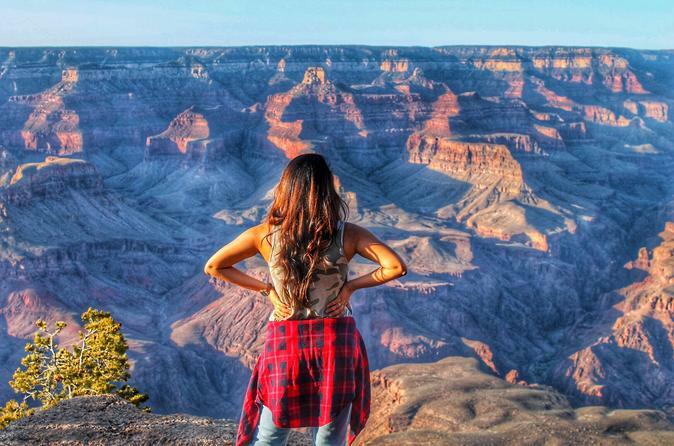 Breathe Deeply because you're about to go the most famous Canyon in the World! And with a big plus... This is a 3 in 1 tour destinations in a small group (up to 7 people) that will make you feel like having an adventure with friends or family! Unique combinations of geologic color and erosional forms decorate a canyon that is 277 river miles (446km) long, up to 18 miles (29km) wide, and a mile (1.6km) deep. Grand Canyon overwhelms our senses through its immense size. Join us at our small group tour to the Grand Canyon National Park! Your journey will begin with a boxed breakfast (Smoothie or fruit salad) and you'll be picked up from your hotel tour lobby around 6am and will be traveling through Las Vegas, Henderson and Boulder City, Nevada. Less than an hour from the Strip, you’ll have a stop for pictures and get amazed at the Famous Hoover Dam. Continue to The Grand Canyon through the Southwest desert, with a stop in Kingman, Arizona, for a short break. View rugged desert wilderness en route to America’s most spectacular natural wonder, the Grand Canyon. On the way to the Canyon you'll make a stop on The Historic Route 66 at Seligman, AZ. Here you'll get your delicious boxed lunch (options available). After that you head to the Grand Canyon National Park where You’ll spend approximately 4 hours of your own time, where you can do a hiking or take the shuttle (free) and visit the visitors centers inside the Park. Your driver/guide will help you out to get the decision that fits better your needs. You must arrive at the Grand Canyon around 11:30am. View the cliffs and slopes of this tremendous natural wonder, a classic example of erosion unequaled on earth, and see the Canyon at its deepest and widest, 277 miles long, 18 miles wide and 1 mile deep at Bright Angel and Mather Point. The story of how Grand Canyon came to be begins with the formation of the layers and layers of rock that the canyon winds through. The story begins about 2 billion years ago when igneous and metamorphic rocks were formed. Then, layer upon layer of sedimentary rocks were laid on top of these basement rocks. Around 3:30pm we'll be heading back to Las Vegas. It's expected to be back around 8:00pm, due to traffic conditions, restroom breaks, stops for stretching and etc.